Major accounting firm benefits from cloud-based solution for price testing large volumes of structured finance bonds. Longtime Intex partner provides custom solution to the challenges of implementing complex scenarios for multi-step calculations in bond portfolios. "This sophisticated capability allows immediate automation of any scenario a client might want to use, no matter how complex." 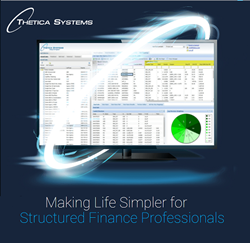 Thetica Systems announces the launch of a cloud-based Structured Finance analytics solution to rapidly price large volumes of bonds using complex scenarios. The client now conducts its monthly pricing process for the full universe of ABS, CLO, RMBS, and CMBS bonds in only a few hours. Users can then produce term sheets for each bond, modify scenario assumptions on demand, and perform ad hoc runs on specific bonds as needed. Thetica Systems’ mission is to enable clients to focus on their own business rules, pricing models, and scenarios, by off-loading the challenging technology issues to an experienced vendor. The company provides a range of services including infrastructure building blocks to jump-start client IT projects, well-tested software components that require only minimal customization, and a cloud platform with highly elastic bandwidth. The company supports Structured Finance portfolios and integrates a wide variety of client-licensed data. Clients include investment banks, hedge funds, accounting firms, professional services providers, asset management, brokers, dealers, and others that invest in or monitor structured finance securities. Users range from traders and trading desks, project managers, research and product controllers to risk managers, regulatory reporting, and IT. The company solves the buy-or-build dilemma for those who require a unique, highly customized, flexible system to price, compare, and analyze bonds. An experienced Intex partner, Thetica Systems can implement any business logic, models, or client-licensed data from any source for CLO, RMBS, CMBS, and ABS portfolios. The word “Thetica” was created from the Greek letter “theta,” representing thought or reason, and “etica,” representing ethics. Thought, reason and ethics are essential elements of any successful business and commitment to this concept is embedded in the company’s name. For more information visit the company website and LinkedIn page.